I’d like to introduce you to a card game called A Game of Thrones: The Card Game (Second Edition). This game is an LCG (Living Card Game) which means that the game expands through expansion packs which increase the card pool size for you to build decks with. Unlike collectible card games you get all the cards in each pack and don’t have to chase after certain powerful cards. This review is just about the core box. In this box is everything you need to play. 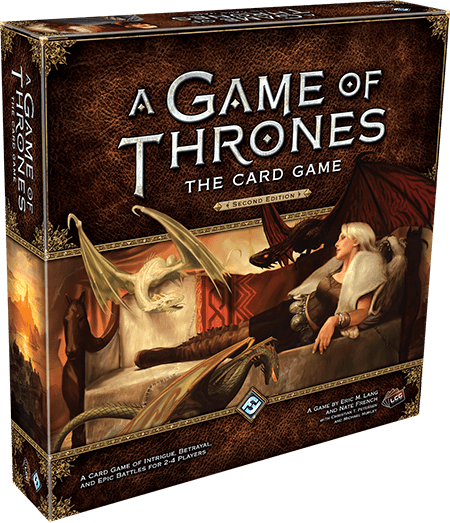 What is A Game of Thrones: The Card Game (Second Edition) like? This is the second edition of the game and I won’t focus on the differences in this review. I would however like to mention that the new edition is a lot more streamlined. This game can be played casual and at a more competitive level at Store, Regional and other leagues endorsed by Fantasy Flight Games. Instead on focusing on the competitive aspect of the game I would like to focus on the game as a casual game. Players are in a race to 15 power to win the game. How this works is, players play characters, locations and event cards to battle each other in three different challenge types in each round. The three different challenge types each have their own effects upon winning such a challenge. At the start of each round players also play plot cards that provide an effect that impacts the round. This plot also determines your income, who starts the round and the impact of your challenges and how many cards you may keep in hand at the end of the round. It becomes clear that players have to pick their plot cards for each round wisely. After plot cards are revealed players get the opportunity to play cards from hand to impact the game state. Usually characters, locations and enhancements are played. Okay, its no secret I love this game. Once I read the rules I was hooked. I’m not even a Game of Thrones fan, and you don’t have to be to enjoy this game. The plot phase where players choose their plot card is truly unique and allows for great strategic and tactical game play. Each card in the core set has potential to impact the game play in a powerful way. Fantasy Flight Games decided to put eight factions in the box (Stark, Baratheon, Tyrell, Targaryen, Martell, Greyjoy, Lannister and The Nights Watch) which means every faction just has around 20 unique cards to work with along with the cards that work with each faction. The rulebook comes with pre-constructed deck lists to build. And that is my only complaint at this point, that if you want the full experience with deck building and more consistency in card draw, additional core boxes are needed. The game takes place in the world of Westeros in the Game of Thrones. Each faction plays differently and in such a way that corresponds to how the house is in the Game of Thrones. For example Stark is strong in military and triggers on sacrifices that are made and also gain aid from their Direwolves, while Martell likes the long plan and try to defend in the early rounds and gain time for their powerful effects in the later rounds. All the cards have unique beautiful artwork and the houses each have a different colour template what really works for me. Its a card game so all the art is on there, but there are also some nice functional tokens. Production is very nice. Good card quality, although players of card games regularly sleeve their cards to keep them undamaged. The box insert doesn’t really help storing your decks and only two zip-lock bags are included. The game comes with two excellent rule books. One that teaches the basics of the game and one with explanations and detailed rules, like timing rulings. The basics of the game are easy to understand, but its the text on the cards which make it daunting at first. A lot of cards change some aspect of the rules or interact in certain ways that will only click after multiple plays. The core box offers enough to play, but if you want a bit more out of the game and you want to build more decks buying one or two more cores is needed, especially if you want to play multiplayer games.